Never a dull moment in our house. Friday evening started off as loads of fun. After dinner, the boys were running around Ben's room playing with a Nerf football. All of a sudden, there was a bang, followed by Nick screaming and Ben yelling, "NICK NEEDS ICE!" Tom grabbed the ice and I ran upstairs only to see blood dripping all over the floor and all over Nick. He tripped on Ben's area rug and landed smack on his face on our hardwoods. In the process, Nick bit his lip in multiple spots. One of those went all the way through, making what was essentially a horizontal hole in his face right under the lip. I drove him to the ER. Thankfully, we are just a couple of minutes from a fantasic (and newly renovated) pediatric ER at a good hospital. We didn't even have to wait--they took him right back and he was stitched up. In fact, we were home in less than an hour. It also was enough to loosen a baby tooth enough for it to come out last night. Nick is a trooper and he is in GREAT spirits, but the injury has made it so he cannot quite close his mouth all the way. This, combined with the dryness of our heat and the cold temperatures, has made his lips so chapped and dry (not to mention those sores from his wounds). Plain old lip balm won't cut it. I don't apply petrochemicals to my boys (like Aquaphor), so I knew I needed something I could quickly find at Wegmans. Online, there are so many options, but we didn't have the luxury of waiting. I thought I could whip him up something and realized I was out of beeswax, so that wasn't an option either. I went straight to the Nature's Marketplace aisle at my local Wegmans and bought a tin of Badger Balm for Sensitive Dry Skin. It is USDA Certified Organic and 100% natural. It was $5.99 for a 2 ounce tin of concentrated product. This has been just what my sweet boy needed. We needed something non-irritating and ultra gentle, something without peppermint (which might sting his wounds), and something that would soothe and protect him. We've been applying it to his lips and the skin all around (he lacerated the area called the vermilion border). We've been fans of Badger Balm for quite a while. I just never have purchased this most basic one. We've tried the Headache Soother Balm and Baby Balm before. I also love their sunscreen and bug spray. All utilize the aromatherapy benefits of essential oils. 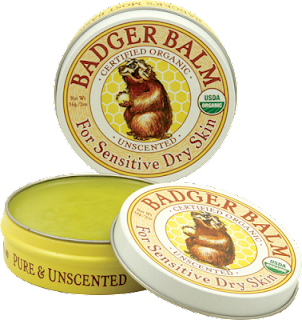 The Unscented Badger Balm is simple. It is also effective. It has helped Nick's sore, chapped, and wounded lips heal. It gets an A+ in my book! Online it retails for $7.99, but like I said it is $5.99 at my Wegmans. If you are looking for an effective balm for chapped, crack, damaged skin I highly recommend this product! *Disclosure: I purchased this product with my own money and am not affiliated with Badger. All opinions are my own.